The first hymn book and hymn writers in America were from England. The hymn book which landed with the Pilgrims in 1620 was Reverend Henry Ainsworth’s version of the Book of Psalms entitled The Book of Psalms: Englished both in Prose and Metre with Annotations, published in 1612 at Amsterdam. It is considered by many to be the foundation upon which all other American hymn books stand. Ainsworth was an English Separatist and a pastor of the English church in Amsterdam. His version of the Psalms was used at Plymouth, Salem, and Ipswich until the mid-1600’s. 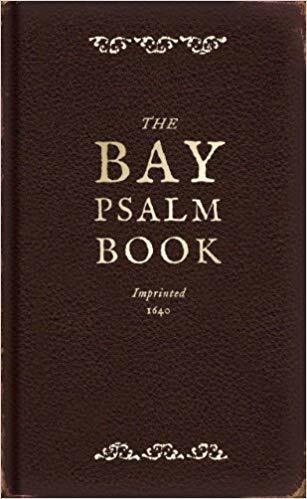 According to historians, the first book published in the new colonies in North America was a song book, The Whole Book of Psalms Faithfully Translated into English Meter, or more commonly, The Bay Psalm Book. This “song book”, the efforts of about 40 men, was first printed in 1640 in Cambridge, Massachusetts, just 20 years after the Pilgrims’ arrival. So church music had entered the new world, but it was not smooth sailing for hymns and songs in this new country. Many works were published for and against this new liberty. One by Reverend John Cotton (Grandfather of Cotton Mather), a treatise entitled Singing of Psalms a Gospel Ordinance, was produced to meet the objection then being made to a metrical version of the Psalms. The current argument was that the word “singing” in the Scriptures meant nothing more than the attitude of thankfulness and joy in the heart. Pastor Cotton insisted in his argument that the “singing of Psalms with a lively voice is a holy duty of God’s worship” (p 2). Also, that “not only the Psalms of David, but any other spiritual songs recorded in Scripture may lawfully be sung in Christian Churches” (p 2). Church records and writings show that during the latter part of the 1600’s into the early 1700’s music in our churches was almost entirely neglected. “the Tunes that are already in use in our churches; which, when they first came out of the hands of the composers of them, were sung according to the Rules of the Scale of Music, but are now miserably tortured, and twisted, and quavered, in some Churches, into a horrid medley of confused and disorderly noises… Our tunes are, for want of a standard to appeal to in all our singing, left to the mercy of every unskillful throat to chop and alter, twist and change, according to their infinitely divers and no less odd humors and fancies” (p 3). He doesn’t stop there but adds “… one man is upon this note, while another is a note before him, which produces something so hideous and disorderly, as is beyond expression bad. …and besides, no two men in the congregation quaver alike, or together; which sounds in the ears of a good judge, like five hundred different tunes roared out at the same time…” (p 5). In an essay written in 1720, Reverend Thomas Symmes asked some questions that are still asked today: “Where would be the Difficulty or what the Disadvantage, if People that want Skill in Singing, would procure a Skillful Person to Instruct them, and meet Two or Three Evenings in the Week, from five or six a Clock, to Eight, and spend the Time in Learning to Sing?” (The Reasonableness of Regular Singing, Boston, 1720 as quoted in Richard Crawford, America’s Musical Life, New York: W. W. Norton, 2001). Thus, the industry was spawned. Singers needed songs. Songs needed writers. Writers needed publishers. . . And so it goes.